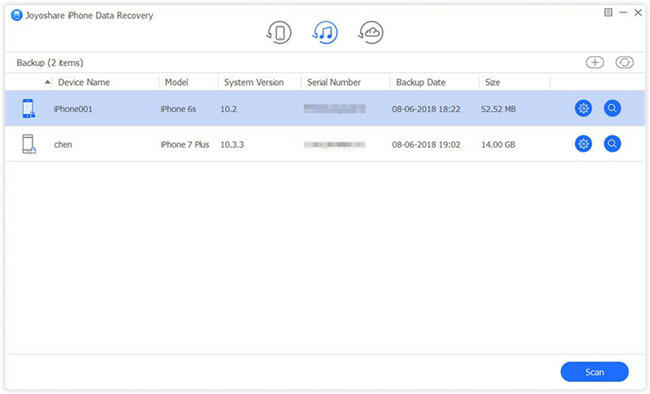 Recover Data from Dead iPhone? Why Not Look Here! iPhones can cause all sorts of unpredictable problems over time. Sometimes, it is not because of improper operation done by you that data loss happens, just like Kuck's dead iPhone. But it might results in further data damage if you don't adopt reliable methods to recover data from dead iPhone. Wanna avoid such a depressing situation? You are supposed to read on. Sincerely, dead iPhone can do nothing for you. The only thing that matters is the data stored in the phone rather than the device itself. Without doubts, you must be very helpless in the face of a dead phone. How about turning to a professional dead iPhone data recovery for assist? Among various options, Joyoshare iPhone Data Recovery is surprisingly ideal. This amazing tool can cure you from different data loss disasters, such as system crash, virus attack, accidental deletion, factory reset, water damaged, device stolen, screen broken, passcode forgotten, upgrade failure, etc. 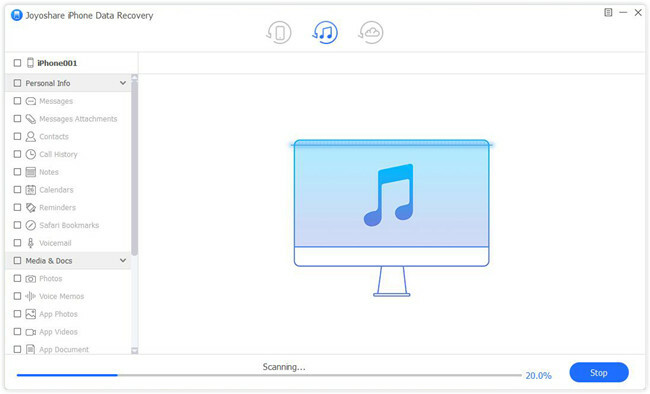 In addition to scan iPhone data directly, it can also be applied to fetch desired data from iTunes or iCloud backup. Best of all, it is capable of supporting up to 20+ kinds of iOS data, like videos, photos, notes, reminders, call history, contacts, WhatsApp/Kik/Viber messages, voicemails, etc. You can even selectively restore data in a flexible manner. Possibility is that your dead iPhone can still be detected by your computer after connected. Try it by referring to the instructions below. 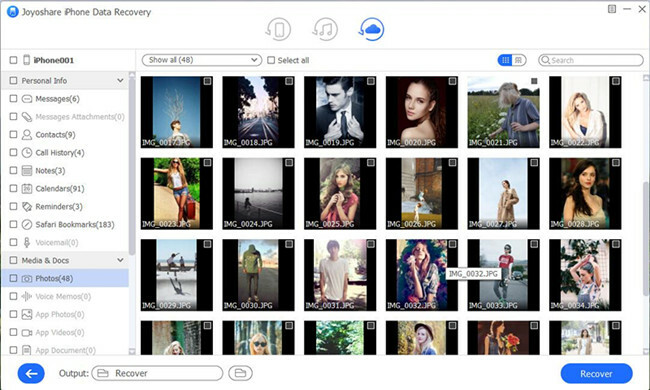 If no access you can get, go straight to see contents on part 2 and part 3, which mainly talk about backup data recovery. 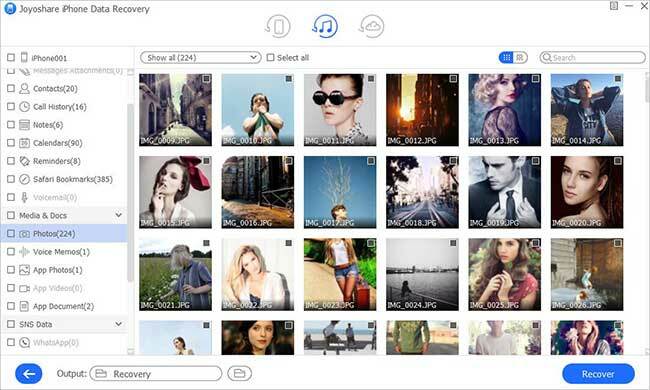 Download and install Joyoshare iPhone Data Recovery from official download page. Use an original USB cable to keep iPhone connected with computer after run this program under "Recover from iDevice" mode. If you are lucky enough, your dead iPhone can be detected without problem. In this case, move pace to the left side to confirm data types that you'd like to scan later. Important data like "Contacts", "Calendars & Reminders", "Photos", "Notes & Attachments", etc. can be ticked at your own will. 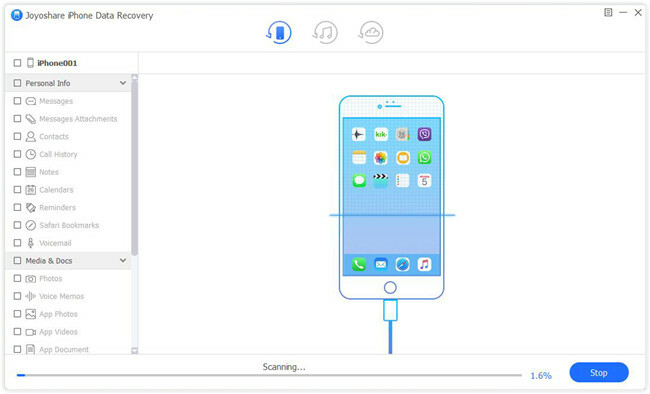 Hereafter, you can press the "Scan" button to start scanning files on dead iPhone. 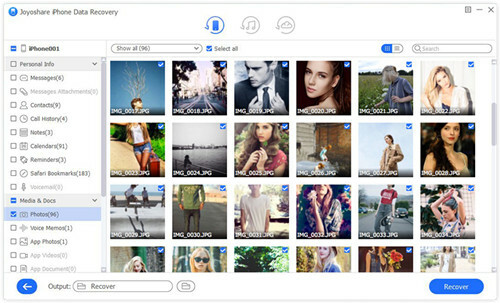 All your recoverable iPhone data files will be classified in the left column once Joyoshare iPhone Data Recovery stops scanning. Filter out data by choosing "Only show the deleted" or "Only show the existing". Tick precious data you need and click "Recover" button at the right bottom. This solution requires at least one iTunes backup file. Briefly, you have to sync your iPhone data with iTunes before. If so, there is no obstacle to reinstate dead iPhone data with steps below. 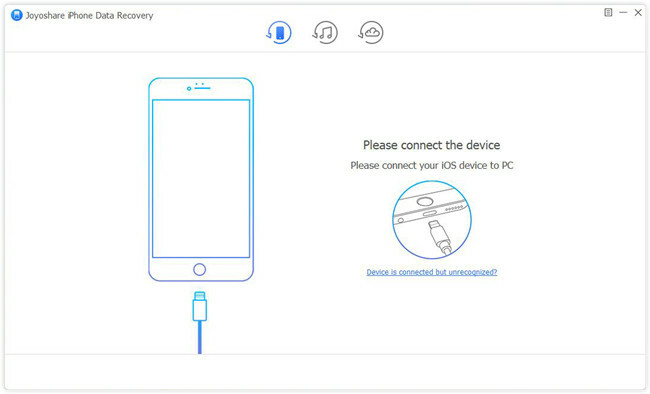 Open Joyoshare iPhone Data Recovery and go direct to the top menu bar to select recovery mode as "Recover from iTunes". You are taken to see all your iTunes backup files. Pick up the most relevant one and continue to tap on its "gear" icon to check designated data. You can as well scan all data by default. Then hit the "Scan" button to find data. The scan time depends on the actual situation, the amount of selected data file. Afterwards, both deleted and existing data will be displayed orderly for you to choose. Preview them in the way you like and get what you want ticked. To export all on your computer's local folder, just click the "Recover" button. 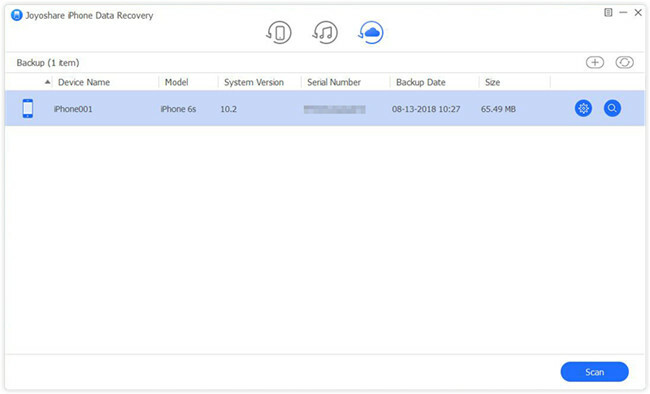 On the premise that you have enabled "iCloud Backup" option on your iPhone "Settings", you can have one more opportunity to extract data from iCloud backup. Simply, only 3 easy and straightforward steps have to be carried out. 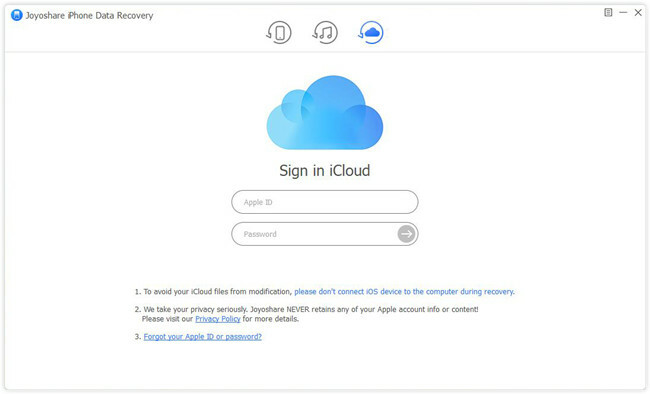 Likewise, to get started, you should firstly launch Joyoshare iPhone Data Recovery and then sign in your iCloud account under "Recover from iCloud" mode. Take it easy. No records will be taken by Joyoshare and everything goes safely. See also: 4 solutions to forgotten iCloud password. All iCloud backup files will be detected and shown with details after your iCloud account login. Download the most recent one and select data types, after which you are allowed to scan files with a "Scan" button. Wait for a moment until scan process comes to end. Next you ought to preview preferred categories and look through items one by one. Or search specific files with "search" tool. The marked dead iPhone data will be output to your computer soon after press "Recover" button.